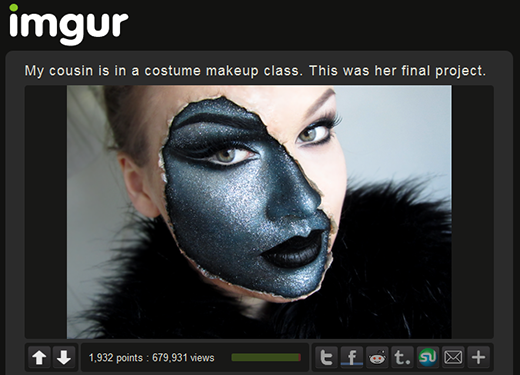 My GLITTERATI-look got 679,931 views on imgur.com - not bad! In fact, I'm blown away! The bad thing is that I wasn't the one posting the picture - nor am I cousin with the person who did (as she/he claims) or attending any kind of makeup class. (I am self-taught.) Oh well, it's the internet.. but a tiny bit more respect would be nice to see. I'm happy that a lot of people found their way here though, thanks to "daisydarlingdoo"@imgur who was wonderful enough to post a link to my blogpost about this makeup look and I hope that at least some of you will be returning. Don't know if she'll ever see this but I can't leave comments on the website without signing up so I thought, well, this is better than nothing. A huge thank you!